GRAND CANYON – Grand Canyon National Park’s North Rim will open as scheduled May 15 with limited visitor services despite major storm-caused breaks in the only pipeline that supplies its water. The pipeline, installed in the mid-1960s, feeds water from Roaring Springs, located approximately 3,500 feet below the North Rim. Water is piped from the springs to the South Rim via a 16 mile-long pipeline. Water is then gravity-fed to the Indian Gardens pumping station, located 3,000 feet below the South Rim, then pumped from Indian Gardens to South Rim water tanks. Water is also pumped from Roaring Springs to North Rim water tanks by a seven mile-long pipeline. Portions of the pipeline are exposed and therefore can be susceptible to breaks. The park hired a private local contractor to haul at least 40,000 gallons of water a day to storage tanks on the North Rim. Hauling began midday April 28, and will continue until the pipeline is fixed and the park has enough drinking water stored for visitors and to meet structural fire requirements. Pipeline repairs are ahead of the original 45-day anticipated schedule despite extremely challenging work conditions. Park management still anticipates restoration of most lodging, camping, and other services at the North Rim by May 26, with some water-conservation measures for North Rim visitors and employees. Grand Canyon Lodge North Rim, a Forever Resorts property, will offer limited food and beverage services starting May 15. Overnight accommodations begin May 26. Campsites will open May 15 with potable water and portable toilets, but no public laundry and shower facilities. The North Rim grocery store, gas station and post office will be open. Grand Canyon Trail Rides offered at the North Rim will begin operations May 15. The North Rim Visitor Center and Grand Canyon Association bookstore will be open as scheduled from 8 am to 6 pm daily, with a variety of ranger programs offered. The backcountry information center will be open 8 am to noon and 1 pm to 5 pm daily. 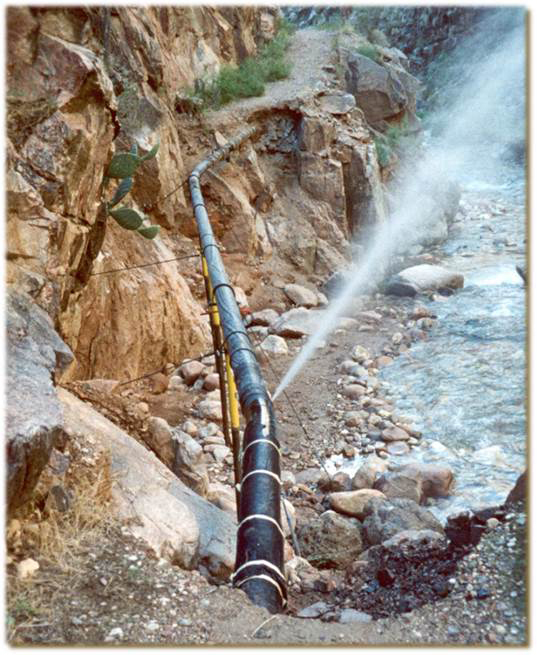 South Rim and Phantom Ranch operations are not affected by the pipeline damage. Multiple breaks in the North Rim pipeline were caused by unusually heavy winter storms that led to rockslides. It is the worst damage the pipeline has suffered in more than 20 years. Partially exposed as it traverses rough canyon terrain, the pipeline is subject to frequent damage from rockslides as well as age-related failures. 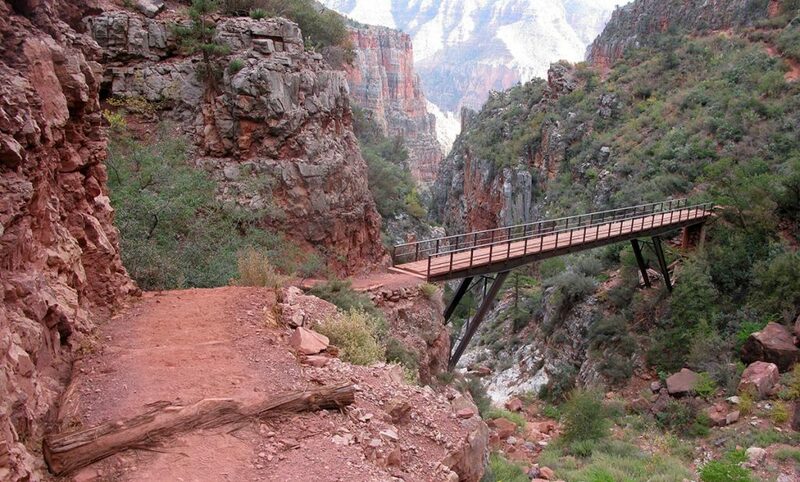 Park maintenance crews discovered March 14 that a rockslide had taken out more than 300 feet of horizontal pipeline on steep terrain, and damaged eight retaining walls and about 800 feet of the North Kaibab Trail. The initial break was repaired, but when park crews tested the pipeline April 25, they discovered another 60 feet of vertical pipeline was missing higher up on even steeper terrain. The new break and two smaller breaks above and below it could be fixed as early as May 6. Minor leaks may also need repairing, but a visual inspection of the pipeline indicates there are no more breaks. Equipment and replacement sections of pipeline must be helicoptered in. The pipeline must be positioned, welded, and assembled on the sides of dangerous and steep cliffs. Helicopter support, fall-protection equipment, and other required safety materials are being used to keep the crew safe. “The priority of the park’s response to the incident is minimizing risk and addressing the well-being of employees, partners and visitors, while doing all we can to mitigate this situation,” park Superintendent Chris Lehnertz said. The North Rim pipeline transports water from within the canyon at Roaring Springs to the North Rim and is operated from approximately May to November. The only public potable water available on the North Rim is stored in its water-holding tanks. The North Kaibab Trail has been repaired and is open, although hikers may experience brief delays as trail crews continue working. The National Park Service emphasizes the importance of staying on designated trails at all times and hikers should not attempt to go over or around a closure. Trail users should pay attention to directions from park rangers, volunteers, and signs placed along the trail. For updated trail information about the North Kaibab Trail, click here, Twitter @GrandCanyonNPS or call the recorded information line at 928-638-7688. For additional information about trail access and permits, call the Backcountry Information Center at 928-638-7875.